XXXVIII, 251 p., 11,2 x 17,4 cm. Edited by Hans Georg von Manz and Ives Radrizzani. In cooperation with Erich Fuchs. 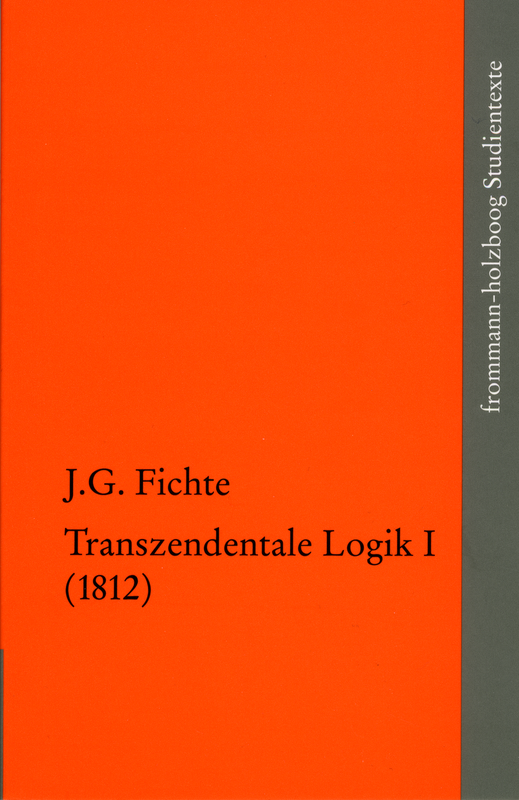 The two lectures on ›Transzendentale Logik‹ (Transcendental Logic), held in 1812/13, are published in two separate volumes. The first one, held in the summer semester of 1812 and entitled ›Vom Verhältnis der Logik zur wirklichen Philosophie‹ (The Relationship of Logic to Real Philosophy), is now being made accessible to a larger readership for the first time. It provides additional information on his reflections regarding the position of logic in the entire system of epistemology, reflections which he had already begun during his time in Jena. Conceived as a preparation for the epistemology, its aim is to eliminate the flaws of a merely formal logic by exposing the origins of the terms. What is involved here specifically is the relationship between philosophy and reality. This is a new publication undertaken after re-examination of the text and with the inclusion of the transcripts by Fichte’s colleagues. An introduction, indexes and a bibliography complete the volume.